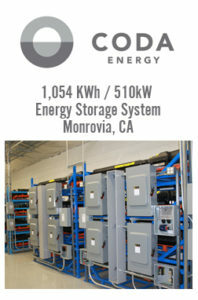 MONROVIA (December 19, 2014) —Today CODA Energy announced the full interconnection and operation of the largest behind the meter lithium-ion energy storage system in the Los Angeles basin. The 1,054kWh / 510kW system was developed and co-funded through California’s Self-Generation Incentive Program (SGIP). The project demonstrates the scalability of CODA Energy’s peak shaving product architecture by managing demand charges for its facility headquarters. In a year when the energy storage market has been poised for explosive growth – one that can be compared to the booming solar PV market 5 years ago – CODA Energy has decisively moved to a leadership role in California’s behind-the-meter market. CODA began installations at the beginning of the year and already has nearly 3MWh of energy storage installations with manufacturing, retail, and public sector customers. With manufacturing based in Monrovia, California, CODA Energy designs and builds scalable commercial and industrial energy storage solutions that support a smarter, cleaner, and more resilient grid. “CODA Energy set high goals for this year. We now have proven solutions that cover the full spectrum of our commercial and industrial customers’ needs for peak power and energy. Our behind-the-meter active and interconnected storage systems range from a 40kWh UL listed energy storage appliance to this 1,054 kWh scaled and tailored aggregation solution,” said Peter Nortman, COO and CTO at CODA Energy. “We provide the most innovative, reliable, and technologically advanced storage systems currently available. This system is actually comprised of two (2) networked and aggregated multi-tower systems that can operate in concert or deliver independent, specialized services. CODA’s scalable hardware and proprietary networking software give us high flexibility in system configuration, and the ability to expand in a cohesive and modular way within a site, across multiple sites, or regionally. We have achieved our 2014 goal of putting a solid, working foundation in place that we can scale from,” added Nortman. CODA Energy’s commitment to its customers’ needs and leading growth in the energy storage industry is fundamental to the scalability of its business. The company’s technology is also highly adaptable, as evidenced by projects ranging from small commercial applications to large scale installations. In addition to the 1,054kWh project, CODA has installed two more multi-tower networked systems totaling another 1MW that are ready to interconnect, and a third 120kW networked, multi-tower array that is currently undergoing validation and slated for customer delivery in early 2015. The 1,054kWh / 510kW energy storage system is comprised of new lithium-iron phosphate electric vehicle (EV) battery cell packs and demonstrates the possibility of second life electric vehicle (EV) battery applications. The project provides large-scale peak shaving for the CODA Energy manufacturing facility in support of the company’s existing and growing energy needs, alleviating CODA’s usage of the local grid. As part of the company’s building load management, the system is used to power EV charging stations for CODA Energy’s electric vehicle fleet and local visitors to Monrovia’s nearby downtown businesses. For more information please contact press@codaenergy.com.